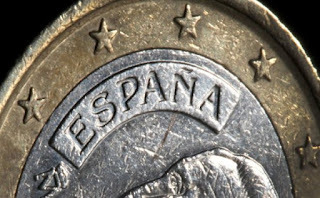 Open Europe: A virtual Spanish bailout? It seems that Spain wants the ECB to lend directly, rather than buy bonds. Wouldn't that make the ECB just a bank? Even Spain will not be so stupid to go for that as it would mean a clear violation of 123 (no bail out by ECB). One that even the ECJ could not fix anymore. However we might see some suggestions like this by people that do not really have their eyes on the ball and are looking solely at their own political position in Spain iso meeting some pretty essential legal requirements. The problem the credit on the homefront shows up as a liability (chance some Court stops it) on the other side of the BS. Anyway basically the markets posution re Spain is: donot get into deep as the ECB might start to buy. Without potentially ECB intervention it would be toast (and the black variety). This is certain to get tested price of bonds is higher and considerably than their value when unsuported by ECB/EZ. So normal market parties will basically sell. Putting upward pressure on the yields and making more people nervous that start to sell etc. First all normal market parties have to be out before dodgy bankrupt Spanish bank whose arms' are twisted by the local government can step in and dump the garbage at the ECB (repo). At least that is what Spain thinks if loger term acceptable in the North doubtful. And there are still alot of normal parties in. Big question is if the ECB can easily keep yields below basically EZ average or even the present yields. Imho that will be pretty difficult especially for the longer term bonds. If lateron the ECB would decide the country can stand on its own 2 feet it would be at 6-7% annual for 10 Y. That reflects in the price when there is ECB support. Basically what we see now but in the mirror. People expect ECB out in say 5Y and with yields going to 6-7% they will price that in. Not even to mention the EZ/ECB stopping things because forced politically. Or Spain and Co not meeting targets. Or and that is shorter term transmission even with huge support doesnot work (as that is what going to happen of course) and it becomes very obvious that it is simply state financing with a very thin veil. Anyway politically in the North this is not going to happen. Italy markets are in doubt but are in their bipolar world clearly in an 'up' now. Very doubtful if that remains that way when it gets in a down again. Likely when Spain has to be forced by market pressure. Lousy combination for Italy. So they probably will be next on the block. And how many Angels really can dance on the head of a pin? Its just words, being thrown around as if in a kaleisescope, hoping that next time they will form a pretty pattern that everyone will like. Or that no one will see through, at least not for the first 3 days. Its nonsense, and trying to analyse it is pointeless. Its like theatre critics analysis Waiting for Godot - each sees what he wishes to see, none agree ith anyone else. This parrot is dead. The Spanish strategy for tapping into the ECB’s OMT program is becoming clearer. In a nutshell, the plan is to sign a Memorandum of Understanding with the ESM for an Enhanced Conditions Credit Line. Once these preconditions are met, the ECB has already compromised its independence by obligating itself to begin buying Spanish debt on the secondary market. Spain does not even have to take an advance on its ECCL – it just needs the MOU in hand. With that MOU, and no money outstanding on its ECCL, Spain gains tremendous leverage as a large debtor nation. At that point, it becomes a matter of the ECB’s resolve to enforce conditionality versus Spain’s potential inclination to take the ECB hostage. Don't worry: Hollande has just told us that the crisis is solved. So that's all right then.